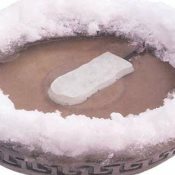 Click on thumbnails to see larger photos. The first photo is an adult female, that is at least two years old (After Second Year - ASY). 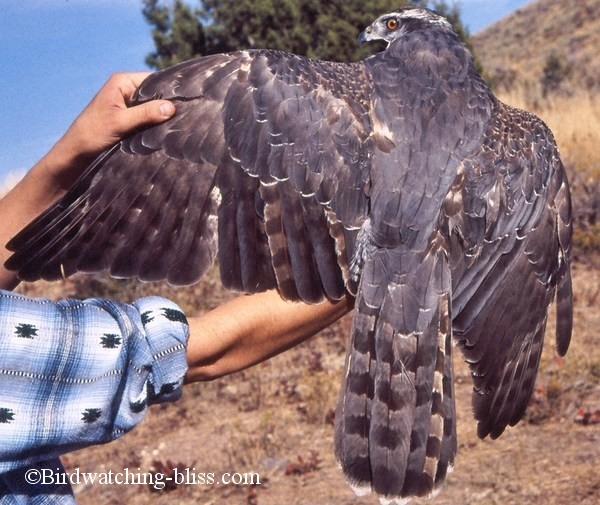 The picture shows the typical eye color of an adult Northern Goshawk and the prominent superorbital ridge that protects the eyes as they crash through the vegetation attempting to capture prey. This photo is an adult male. This bird has a darker eye than the female above. Males are smaller than females, and this is even obvious in the photos with this male's smaller head and beak than the female in the previous picture. Note the distinct white superciliaries against the dark head (a key identification mark). 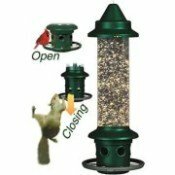 Adults have bluish-gray backs and upper wing coverts, grayish breast and belly and white under tail coverts. This next photo shows the juvenile plumage of the Northern Goshawk. 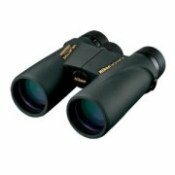 The back and upper wing coverts are mottled brown. The tail has alternate light and dark bands. The belly and breast are heavily streaked. 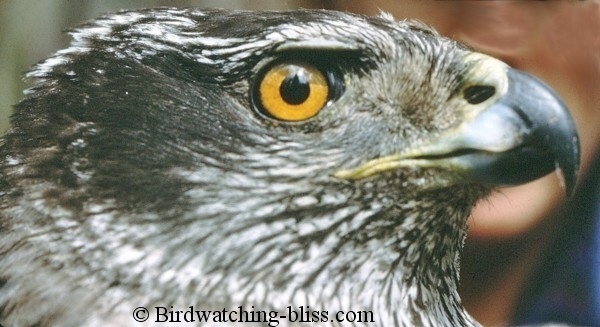 The eyes of immature goshawks are yellow. This picture is an adult goshawk that is just over one year old (photo taken in Oct.). Notice that some of the feathers in the middle of the left wing are darker than others. These darker feathers have been replaced (molted) and are new. 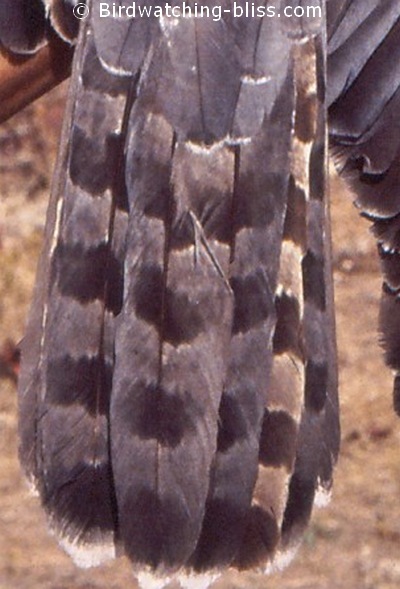 The faded brown juvenile feathers are older feathers that have not yet been replaced. Since there are both juvenile and adult feathers on this bird, we know that it was hatched during the Spring of the previous year. We would age this bird as Second Year (SY). The next photo shows a closer look at the tail of the second year bird above. Tail feathers are called rectrices. Notice the old, faded brown juvenile feathers that have not yet been replaced. Raptors in general have 12 tail feathers. 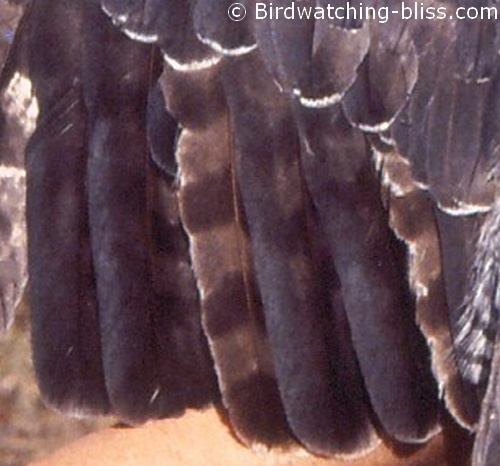 This is a closer view of the molting secondaries from the same second year bird. In this photo, these Northern Goshawk chicks are between 20-22 days old (after hatching). In the first video, one of the adult goshawks brings a chipmunk to feed the chick. 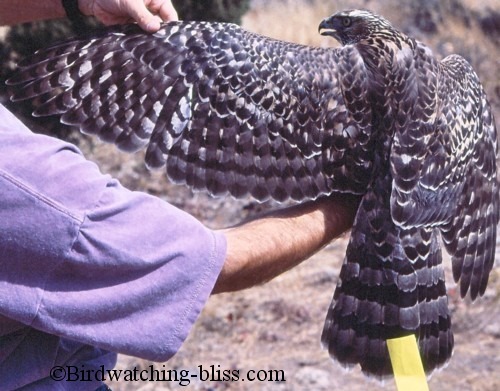 The next two videos show the goshawk's amazing agility. 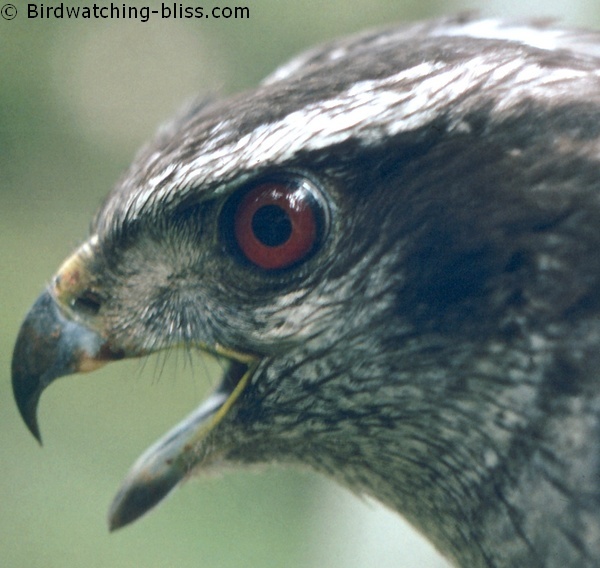 The first video shows a goshawk eye view as the bird flies through the forest with a camera on it's back. This last video shows the goshawk's agility flying through obsticles in slow motion. 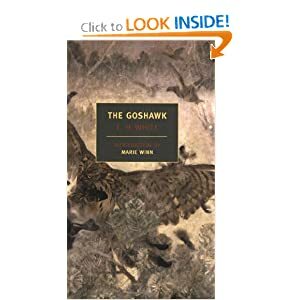 The Goshawk is an outstanding book by T.H. White, chronicling his arduous journey of training a goshawk using ancient falconry methods.